Opening hours: Tuesday 22 – Friday 25 January 2019, 10am – 5pm. Late opening: Thursday, until 7pm. Halsway Manor is delighted to be holding a temporary exhibition celebrating memories of Halsway, and focussing on two key figures in Halsway’s history: painter Frances Gair Wilkinson and folklorist Ruth Tongue. Visitors are also welcome to use the opportunity to view the ground floor of the Grade II* listed Manor House, including the Great Hall, Victorian Ballroom, wood paneled lounge and library. Frances Gair Wilkinson was the previous owner of Halsway Manor, running the Manor as an art school before agreeing to sell the house to the Halsway Manor Society to continue her vision of Halsway as a centre for creative arts. Halsway is the caretaker of a wonderful collection of paintings by Frances and by her parents Arthur and Lily. The collection includes oil and watercolour paintings depicting scenes from Somerset and further afield in Italy and Bavaria. A must for aficionados of landscape painting these recently restored works are on display to the public for the first time. Ruth Tongue was a local folklorist, dramatist and storyteller, and her impressive archive is held within Halsway’s library collection. She is well remembered in old age, but Halsway has permission to exhibit images taken from a beautiful handwritten and painted book of folktales from her earlier years, giving a rare insight into the creative mind of Ruth as a young woman. 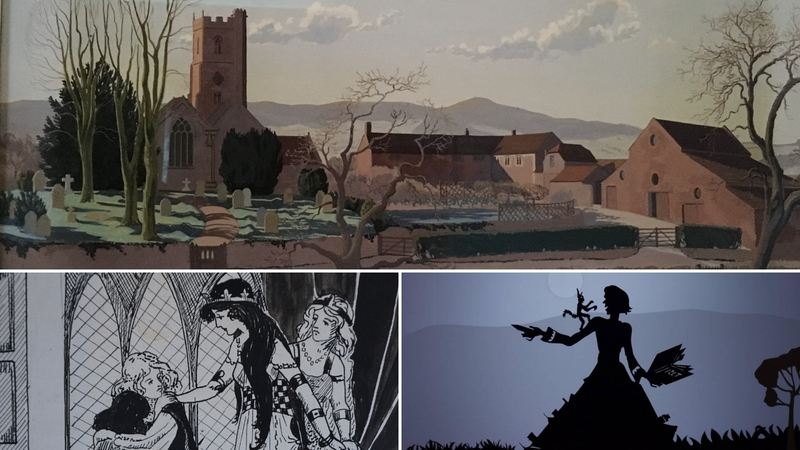 Alongside this, visitors will get a chance to see elements of contemporary artist Andrea Oke’s Shadowlands project which was inspired by Ruth and exhibited as part of Somerset Open Studios 2018. In addition to the two exhibitions there will also be a display celebrating personal memories of Halsway.